The requiem or Requia, according to the liturgical rite of the Catholic Church is a Mass performed and celebrated in memory of the deceased. It can also be used as a funeral service, in particular in the case of solemn funerals, there is also the use to run it as part of the liturgy in the day of the dead, who are commemorated on November 2. On a more strictly musical term a requiem is a composition that uses the hymns of the Catholic rites (or other religious ceremony) with a musical texture: these dramatic texts, over time, have attracted the attention and stimulated inspiration for many composers. While, as regards the popular use, the word requiem, it arises from the opening words of the Introit: “Requiem aeternam dona eis, Domine, et lux perpetua luceat eis.” (“Eternal rest grant unto them, O Lord, and let perpetual light shine upon them. “). As for the Italian band I’m glad to point out the singular reinterpretation by Giovanni Lindo Ferretti, lead singer of the CCCP band that inserts some short pieces of the Requiem at the beginning of the live version of Militanz, on the album Live in Punkow, creating a striking contrast between the solemn requiem rhythm and the fast punk-rock-Soviet piece . A true example of a concept album conceived as a true Requiem war is the album “The Final Cut” by the British rock band Pink Floyd bassist and singer Roger Waters group dedicated to his father, Eric Fletcher Waters, British officer killed in War during the Battle of Anzio in 1944, now buried in Cassino, Lazio. 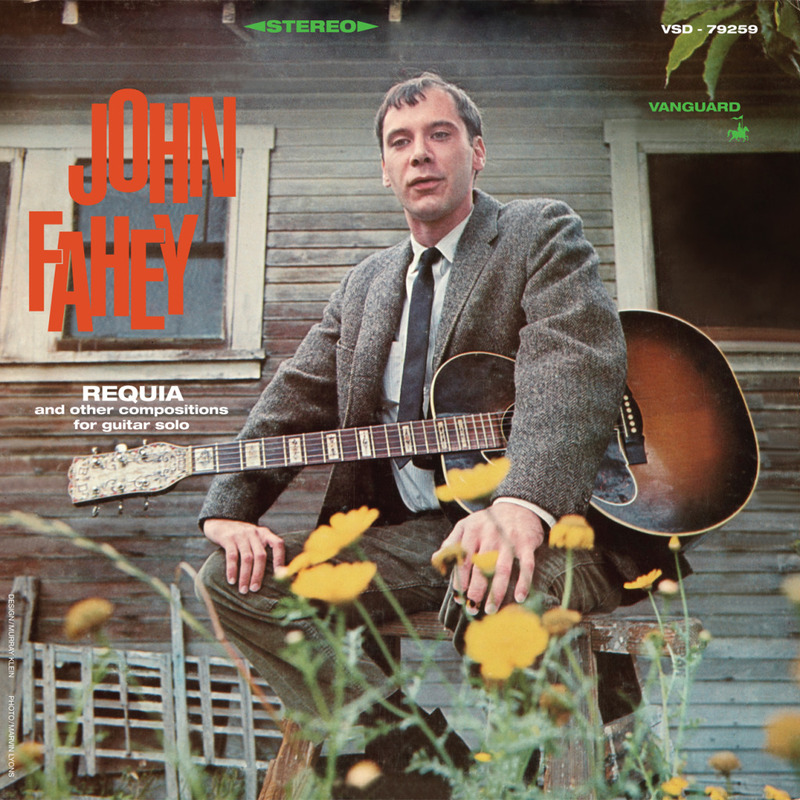 Talking about guitar we can’t miss the two records, subject of this post: Requia (and other compositions for solo guitar), eighth album made in 1967 by the American fingerstyle guitarist John Fahey for the Vanguard label. In those years, the Vanguard had developed an interest in some blues guitarists, characterized by a unique and special style, people like Sandy Bull, Berth Jansch, Skip James, Mississippi John Hurt, Leo Kottke and the same Joanne Baez. The manager of the Vanguard, which was at the time Denny Bruce, former drummer for Frank Zappa, recalls that “His deal was that he could record for Takoma ‘experimental records,’ but to try and make commercial recordings for Vanguard, with their approval of the budget. ” In short Fahey would continue to produce his records with the experimental Takoma, while he would try to produce works more” commercial “with the Vanguard. And so far so good. Things change when we turn the LP down or, if you prefer, or we listen to the fourth track of the CD. Who was Molly? Fahey does not say it, he only writes that “She was well known at Knott’s Berry Farm,” but we don’t know where she is and what happened to her. His Requiem, divided into four parts, is something that still leaves genuinely stunned. In Fahey’s words this composition should be a sound narrative of Molly’s psychological destruction and the reaction of another person who observes the process, perhaps the same person responsible for this cruelty. The result is the large-scale continuation of the experiments tempted in A Raga Called Pat: a risky sound collage, an attempt to create a sort of Musique Concrete, but not very successful. In those times, when getting a multitrack recorder was bold imagination, Fahey mixes in a very rudimentary way songs played with his acoustic guitar with pieces of pure white noise, brands and Hitler’s speeches with music by Charles Ives, California Dreaming by Mamas & Papas, choral music, tape loops, dusty 78s scretches. The result today, after decades of contemporary music and sound manipulation, makes you smile and this requiem did not appear unscathed by evidence and the erosion of time. It remains in my opinion the most lucid testimony of malaise and psychological problems that Fahey was beginning to suffer. Closes the album, bringing the music to the acoustic production that still leaves us listeners, fans and critics ecstatic, “Fight On Christmas, Fight On” based on the song “Christians, Fight On, Your Time Is not Long” by Bo Weavil Jackson and played with a bottleneck. Requia is not the best album of Fahey, but in my opinion is among those that better represent him in terms of eccentricities and musical ambitions. Fahey was the guitarist who more than anyone else has managed to change the original blues matrix, stripping it of its African animism and giving to it the metaphysical and a melancholy abstraction typical of European contemporary music. At the same time he managed to escape from the emotionally arid forms of contemporary music, transfiguring classical music thanks to the generous grafts of African American popular music, playing like Charlie Patton could live with Harry Partch. 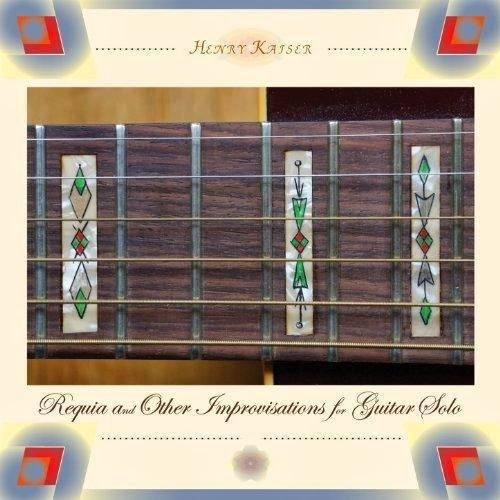 It’s called instead Requia and Other Improvisations for Guitar Solo the record by Henry Kaiser realised in 2013 by the meritorious Tzadik indipendent label. If you think the title is the result of a coincidence then look at the cover of the CD: it’s simply fabulous, even the decorations on the fretboard are accurately reported in the photo! I wonder who Kaiser was thinking about when he played the music of this album? Who knows. But the similarities end there basically. The same Kaiser is keen to point on the title that his are “improvisation”, while Fahey told us about “compositions” and also the style of Kaiser is radically different. This really good record contains a number of excellent references and tributes to famous musicians, reinterpreted with Kaiser’s unique style and, above all, his sense of humor. Heroes like: Basho, Stockhausen, Randy California, Sun Ra, Morton Feldman, Masayuki Takayanagi, Toru Takemitsu, Pete Cosey, Sonny Sharrock … Kaiser reads their influences through his cacophonous, versatile, playful, seemingly superficial, irreverent and intelligent way of thinking and improvising. Perhaps therein lies the strength of Kaiser’s style: despite all his quotes, despite being able to cross in his long career virtually all musical styles, despite having virtually incorporated all the different musical cultures with which he came in contact, he has always managed to maintain his independence, without looking like anyone. I personally find that he gives his best in songs like the dreamy acoustic “Ship That Pass in the Night” dedicated to Masayuki Takayanagi & Toru Takemitsu, the noisy and funky “Tandem Bike Ghost – For Pete Cosey & Sonny Sharrock” and the moving requiem for “Blind Joe Death vs Charlie Appleyard”, his last and respectfull gift to JOhn Fahey’s acoustic and sidereal blues.